The calendar has four different types of view: list, daily, weekly and monthly. Adding a new event is quick and easy, and you can also set an alarm to act as a reminder. The list view shows a list of all the calendar entries from the recent past to the near future. It's a very handy tool when you need to check your appointments for the next few days. The Samsung I9300 Galaxy S III features a decent alarm clock application which allows a huge number of alarms to be set, each with its own start time and repeat pattern. The Clock app also comes with a stopwatch and a timer. They are easy to work with and can come in handy. The Memo and Mini Diary are self-explanatory. The first app, however comes with a twist, as it lets you make elaborate drawings using a rich set of tools. It's heavily inspired by the S Memo from the Galaxy Note and Samsung even sell a special display-friendly ball pen for enthusiasts. S Memo can also work with simple text. S Diary, on the other hand, lets you also attach pictures to the text. There's a YouTube app, which makes browsing YouTube videos from your subscriptions easier. Unfortunately, it cannot match the resolution the in-browser flash player can give you. The Samsung I9300 Galaxy S III comes with a GPS receiver, which got a satellite lock in couple of minutes with A-GPS turned off. A-GPS can speed this up quite a bit, but requires Internet access. We gotta say, we didn't experience any issues with the GPS performance. 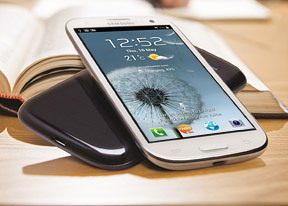 The Galaxy S III comes with Google Maps and Navigation. Voice-guided navigation has become a viable solution since the v5.0 update. Vector maps are smaller and easier on the data traffic and reroute is an option if you go off course without the need to connect to the Internet. In fact, the only time you need a data connection is when you initially plan the course - Navigation will cache the needed maps. Using Street View • What's near by? If Google Maps Navigation doesn't do it for you, you can grab an alternative app from the Google Play Store - there are both free and paid ones. The Google Play Store is full of all sorts of apps. From music / video players, to file managers and various tools, you'll always see something worth a try. The Samsung I9300 Galaxy S III comes with Kies Air preloaded. The app connects to the local Wi-Fi network (or it can create a Wi-Fi hotspot) and gives you an URL to type into your computer's web browser. From there you can manage just about anything on the phone - be it contacts, messages (including composing messages), browsing images, videos and other files straight in your desktop browser. You can grant or reject access to computers and see who's connected to the phone at any moment. The cool thing is you can stream music with handy playback controls. It works for videos too.Note: You'll need a reasonably modern browser with Java and some video plug-in (QuickTime worked for us).